LaFerry’s Propane has 6 convenient locations to refill your grill cylinder, but what if you run out after 5 or on the weekend? Exchange your empty cylinder for a full one at any of the over 100 retail outlets we partner with. Why choose our cylinders instead of another brand? 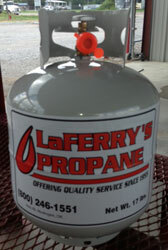 Unlike most other companies that only fill their cylinders with 15lbs of propane, we fill ours with a minimum of 17 lbs. That’s an additional 13% of gas for your grill.